New Caledonia ofers many escapes within short distances. One of mine (and the Missus’) is a small islnad only 15 minutes away by boat from Noumea called Ilot (or Ile) des canards/Ducks Islet. if you have your own boat (a yacht wouldn’t be able to find deep enough water to stop there) wind sail board or kayak you could reach the place quickly enough. For pedestrians, go to Colleen Excursions (Tel. 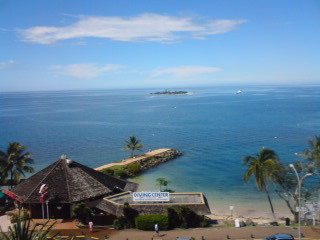 : 28-33-58) in Anse Vata Bay where you can book a boat across the lagoon for 1,000 Pacific Francs (return ticket)/12 US $. 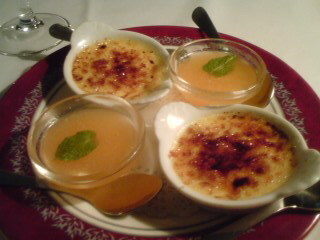 Originally copmpletely desert, a French-japanese couple obtained the license to develop it. Not ony did they build a restarant wih seats and parasols there, they also planted trees and plants form New caledonia, thus ceating a new environment while protecting and furthering native nature. The birds have come back and even “fight off” tourists away from their nests! The restaurant offers healthy and plentiful fare in a great natuaral enironment away but still within a short distance of civilization. The staff are all recruited from the locals who are very warm and friendly. 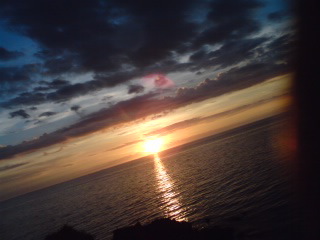 new caledonia is our regular destination when when we find the the time to escape from Japan for a short vacance. being blessed with sun, sea and great food, be it French or “ethnic” of all kinds, it also offers some of the best natural water in the Pacific Ocean! I’m not tired of repeating it, a benediction for beer Brewers and beer lovers! 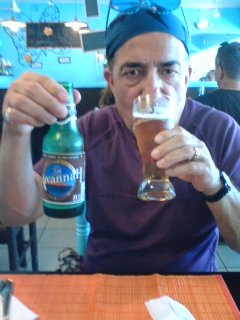 The first one, 3 Brasseurs, is actually a branch of a great microbrewery in France, but it uses only local water and thus can be considered a true New Caledonian mkicrobrewery! sampling their tasting set is simply a must! Mussles and fried potatoes, which is a belgian specialty actually! On the first floor, you can either enjoy a drink at the pub or on a terrace. Check their special band music nights! 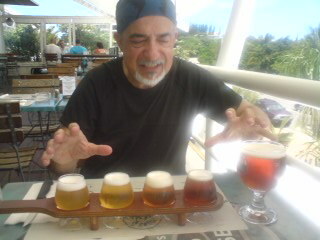 Travelling to New Caledonia becomes a thirsty venture! Even in “Spring” (September), temperatures can uickly soar over 25 degrees in the shade, meaning at least 10 more in the sun! New Caledonia is not only blessed with sun, sea and great food, but it also offers some of the best natural water in the Pacific Ocean! No wonder this island has been settled for millennia as the water is slowly filtered through rocks before to gush out at the feet of pretty high (over 2,000 metres in some cases) for such a small island! A benediction for beer Brewers and beer lovers! 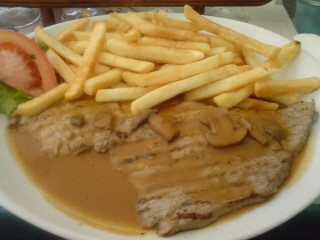 Roast Beef salad at Le Fun Beach. 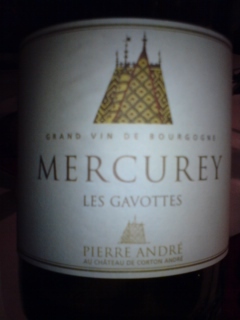 There are many restaurants in Noumearemisniscent of Southern France. Actually the Caucasian population is mainly from Southern France and Corsica. 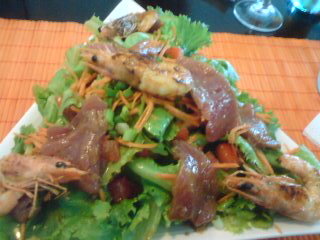 Food in such restaurants is very healthy although a missing a little spice. Sauces and vinaigrettes are light in particular. There are exceptions I will mention in my next posting! 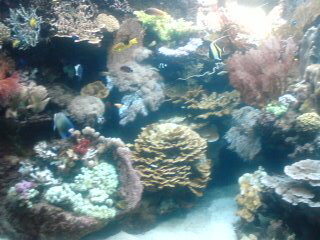 After we visited the recently expanded New Caledonia Aquarium (the only one featuring live phosphorescent corals in the World!) and a long walk in town, we thought it was grand time to try a purely “local” restaurant for lunch away from the ubiquitous tourist traps. 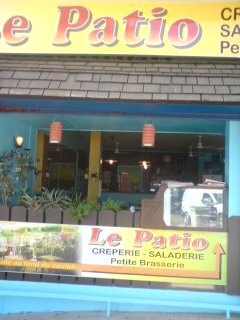 Le Patio somewhat looks like a Caribbean diner, although the atmosphere inside reminisces more of Southern France. Actually, the owners who opened last year are from French Britanny and offer true galettes and crepes! But we were in for lighter fare. We were more interested in their salads. And they are of giant (American?) size. 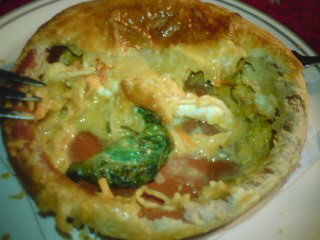 They certainly would tempt Foodhoe (LOL)! 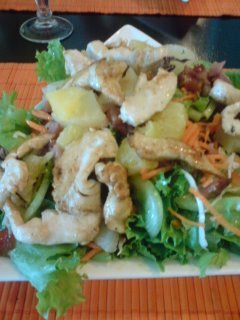 I opted for the grilled chicken salad. Afer all, we had been eating all kinds of seafood. Well, the Missus could not help taking the best bits and leaving me with all the lettuce! Mind you, I love my greens! 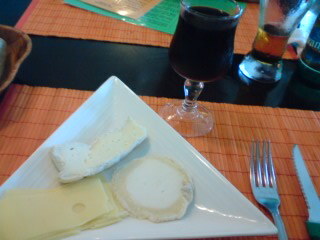 Which left me with some space for the cheese directly brought from France. The Missus, for all her being bent on wine, did not have any space left. 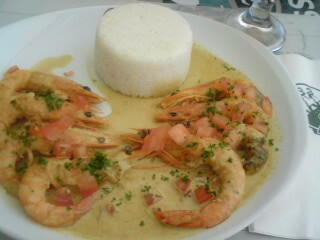 Which was perfect with me, as I still had plenty of the local beer, Havannah, left to drink! 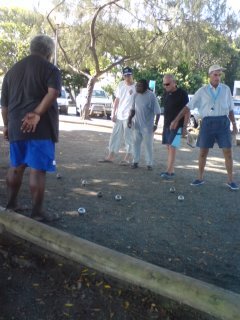 The weather being very hot (38 degrees), we decided to keep in the shade while digesting and looking the local play that very French game, Petanque! Not a bad way to spend the first half of the day! 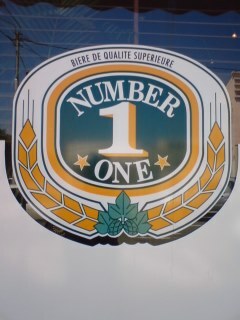 The first one, 3 Brasseurs, is actually a branch of a great microbrewery in France, which uses only local water. but they also include a restaurant where you can eat all typical Alsatian Cuisine. Their main label is Number One. It is a very refreshing lager, especially popular with Ozzies and Kiwis, and quite reasonably priced at that. But I have a little weak spot for their red ale, Havannah! Also reasonably priced, it should please Europeans especiallY! 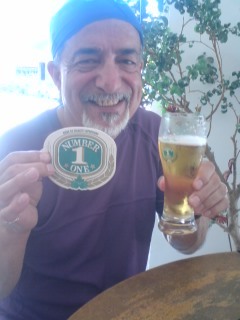 Great beer in a great hot spot in the Pacific! What else could you need? Although this is not srictly within the purpose of this blog, I thought it would be a shame not to share some good moments I spent abroad and thus provide useful and truthfull knowledge away from the “guides” and what else! 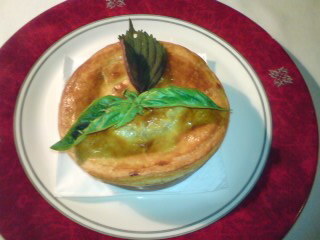 As March 11th is the Missus’ birthday, we (I) thought we ought to celebrate it with a special dinner. La Coupole in Noumea, New Caledonia (we had discovered a very good value free-time tour for three days to this favourite destination of ours) is the best Fench restaurant in the whole island (that is until now…) and located just beside the Surf Hotel where we resided. After a Kir for aperitif (my half pointed out that a glass of Champagne would have fitted the occasion better, to which I replied that I wished to bring her back to the hotel in reasonably good shape…), I chose a Cote Chalonnaise, Red Mercurey, Les Gravettes 2005, one of the best reds in that particular region and certainly better value than overblown Bourgogne greta names. 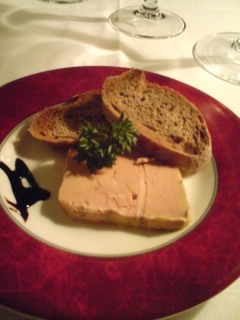 The amuse (see pic above) consisted of foie gras terrine slice with toast and balsamico dressing. I ended up with half of my half (no pun there!) as she felt a bit conscious about her waist. 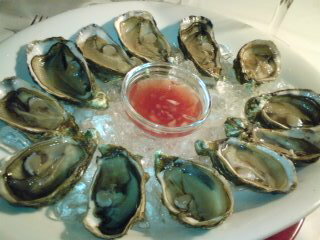 I ordered a dozen oysters from Doumbea. 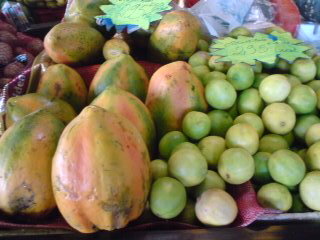 These are raised in the village of the same name and have the particularity to be small, full and succulent. I never seem to have enough of them every time I visit this island. 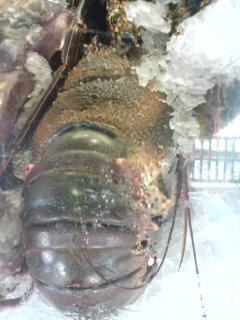 Her Grace chose the Cassolette d’Ecrevissesd de Bolouporis a l’Estragon/ oven baked crayfish from Bolouporis (New Caledonia) with taragon. The crayfish are basically sauteed with a julienne of vegetables and fresh taragon and seasoned fresh cream, then poured in a dish to be covered with light pastry before being baked in an oven. Good balance. It was the first time the Missus challenged crayfish and she loved it. 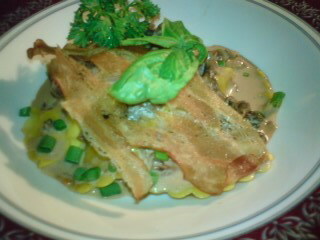 As for the main dish, my wife tried the Croustillant de Saint-Pierre/Sea Bass baked in light pastry (again…). 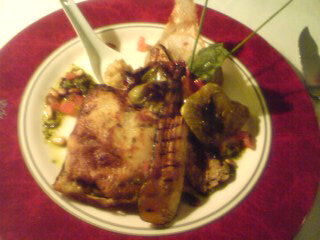 The fish had been emphasized with a slighty spicy seasoning before being wrapped in very light pastry. Good balance again. As for me, I had chosen foie gras (again…) raviolis with morel sauce, which unfortunately I could not keep away from my other half long enough. Which explains why I appreciated half of the firsh she had graciously left for me! 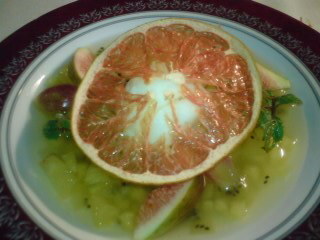 I still had space left for the kiwi and pineapple soup with citrus sherbet. Her Majesty was already full and quite happy nibbling on the “mignardises” consisting of creme brulee an cold melon soup. The bread we were served had been baked in the restaurant kitchen and I had a hard time keeping my hands off it! Coffee, and that was it. The bill was fairly high, but life is more expensive there than in Japan. Very kind and attentioned service. 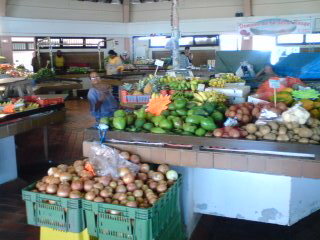 One great way to enjoy and experience the truly local life in New Caledonia and especially in Noumea is to wake up early, skip breakfast and visit tne Morning Market near Port de Plaisance. Almost all buses go there, so there is little chance to get lost. Not only will you find all locally grown vegetables and fruit (plus some imported ones, notably potatoes, altough locals eat yams), but you can buy cooked food at stands offering bread, pastries, Vietnames food such as all kinds of nems, all these at extremely reasonable prices. There is also a large indoors Cafe Stand where you can drink great New caledonian coffee, soft drinks and what else. You can also take advantage of other stands offering crafts and Kanak clothing, paleos and so forth. 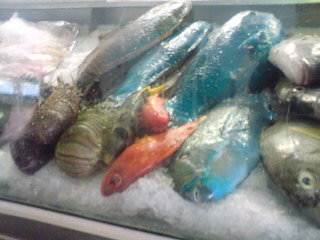 But the must-see are the fish stands displaying sea food caught the day or night before. If you happen to live or stay in a place equipped with its own kitchen, this a great opportunity to choose your fish and shellfish for sashimi, steamed, fried, simmered fish, some of which can be found in the sea surrounding Okinawa. Nice and thorough – heading over soon so thanks for the tips. Have a nice and great trip!